When I was promoted to Program Coordinator for MPOW back in August 2006 my job changed in many ways, and one of them was the volume of voice mail I received grew exponentially almost overnight. I have never been a fan of voice mail, so to go from getting 3-4 messages per day at most to getting 15-20+ on most days made me unhappy (and somewhat disorganized) for several months. I struggled with how to keep track of all the messages and worried constantly that I had not returned a call or had left a task undone. I found I was constantly scribbling a message on a scrap of paper or on a post-it note then losing track of who I had called and when -- or, worse still, misplacing the scrap of paper with the message and then wasting time looking for the scrap. It is more than obvious if you have ever heard me speak that I am a big fan of 2.0 web tools and other online freebies to keep myself organized. I simply could not live without Jott to send myself reminder messages on the commute to work or without all the assorted lists for packing, Christmas shopping, house projects, etc that I have stored on Ta-da Lists. I am an avid user of Google Docs and Calendar and can't imagine what I would do without sites like SlideShare and Doodle. Still, in all this 2.o goodness I could not find a simple and effective way to keep my voice mail under control. 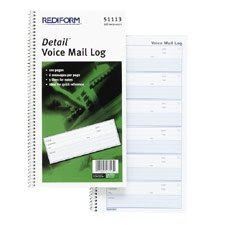 Then I stumbled upon a simple office supply item that has been my savior for the last 15 months - the voice mail log. I know this is not rocket science and it is more than likely that many readers have been using VM logs for years, but I have shown mine to a few people lately who had not heard of them or used them and they are now proud and happy owners of their own log books. Now, you don't need to actually buy a VM log (a simple dedicated notebook could do), but the way the log is set out it really allows you to record every transaction in completion and it can even act as an archive for future reference. Also, for less than $4 the price is nothing to quibble over. The exact log that I use is pictured here and I have filled a few of them in the last year. If anyone has a better solution for voice mail, I would be happy to hear about it. Also, I would be interested to hear what paper-based office solutions you just can't live without. In the past couple weeks, I've listened to a few librarians talk about the woes of their supposed IT specialists. The problem? They are really good with buzzwords and not so great with applications. Some have complained that their IT specialist were generally unfamiliar with basic computer competencies. And while it is generally deemed okay for a 'normal' librarian to be unfamiliar with computer applications and some 2.0 technologies, this should be essential for a person who specialized in IT for their library. If not, we are then left with libraries that stagnate in their IT competencies and fall behind the tech-trend. So, let's lose the buzzword interviews. Let's plan an application process that would really test the abilities of your IT specialist. When the job is posted for a general IT position, require that the application and cover letter be sent via email in an attachment. If they can't do this, which is largely considered a basic competency, then they are not qualified for the job. Require a cell phone number (more on this later). If they are applying for a webmaster position, require them to post their resume online. It doesn't have to be anything fancy, just a site with resume and a link to download the resume as well... to show they have basic web-design skills. If the person's resume and cover letter meet your standards, TEXT their cell phone to set up an interview. Unorthodox? Perhaps, but part of the IT personality is embracing modern technology. Texting is one of the most popular means of communication with our younger population and, if we want to stay current with our patrons, then we need make sure our IT people are familiar with it as well. By this time the interview comes, you will have a basic understanding of the applicant's technological ability. If they needed instruction or familiarization with any of these things, that should be a warning flag. When they give their demonstration, you will also be able to see how well they can communicate the use of these technologies to other people and just how ambitious their Library 2.0 goals are. Yes, I do realize there is a possible flaw in this method; it requires that someone on the interview team be familiar with technology as well. It's a conundrum, that's for sure. But, let's look beyond that. Oh, and if you want to have a little fun with them at the interview, put them in front of a computer with the machine on but the monitor off (or unplugged) and ask them to figure out the problem. Tell them you've tried hitting the machine but 'nothing happened." If they look at you, remark, "I just don't think this machine likes me very much." Then watch for a reaction.